This year’s Bristol Hi-Fi Show sees KEF showcasing the brand new R Series; a complete, top-to-bottom transformation of what was already one of the world’s most acclaimed loudspeaker ranges. Decades of experience and an unbridled passion for music come together in the new R Series. It combines innovations drawn from KEF’s flagship REFERENCE Series with new bespoke technologies to ensure the new models deliver more detail, deeper insight and greater excitement. No fewer than 1,043 individual changes have been made for the new R Series with every element precisely engineered to recreate the exhilaration of hearing music for the first time. Comprising of three floorstanding models; the flagship R11, R7 and R5; the award-winning R3 standmount, R2c centre speaker and R8a Dolby Atmos enabled speaker, each model in the range is available in three stylish finishes; Black Gloss, White Gloss and Walnut. The flagship R11 floorstanding speaker and the KEF R3, What Hi-Fi?’s Standmount Speaker of the Year will be demonstrated in Concorde Suites 1 & 2, Lower Ground Floor with each model from the range on display. 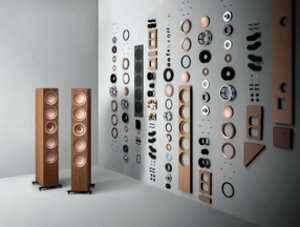 Find out more about KEF R Series.